In response to the City of Davis (City) Request for Expressions of Interest (RFEI) for development of an innovation center, Hines and SKK Developments, collectively referred as “Applicant,” assembled a project team to submit their interest in developing the northwest quadrant site, as the Davis Innovation Center (Project). The Project is envisioned as a new technology hub for Davis, intended to serve an array of research and technology companies interested in locating and growing in Davis. 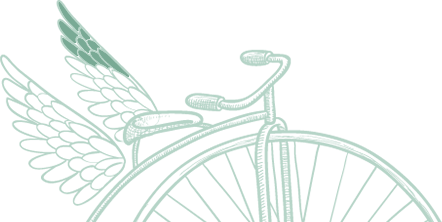 The Project plans for a unique business environment, supporting research and development, technology, and science- and engineering-based companies, eager to expand their products and services. The Project will support an environment of innovation in flexible formats: incubation spaces for small start-up firms, facilities for established mid-size or large size companies; to large floor-plate, flexible building spaces for high-tech research and light manufacturing; and potentially corporate headquarters. Employee-support services and retail will create an active landscape for collaboration and innovation. The Project also provides numerous community benefits, including opportunities for industry partnerships and collaboration research being conducted on the University of California Davis (U.C. Davis) campus; job opportunities to retain young talent and entrepreneurs from U.C. Davis; and local job and economic growth benefits. 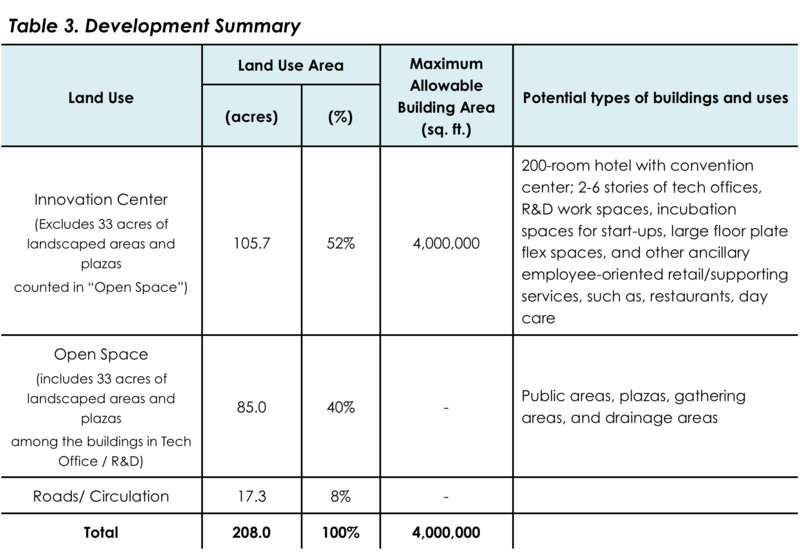 To achieve this vision, the Applicant is requesting planning entitlements for the creation of a master planned campus environment, with a variety of building types and flexible spaces; General Plan Amendment to redesignate the existing site from Agricultural to Business Park; rezoning to Planned Development (P-D); associated Development Agreement; and annexation to the City of Davis. 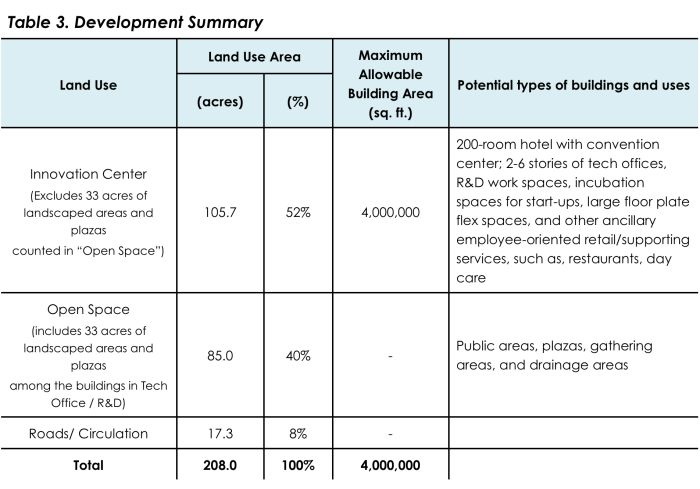 The Project will consist of two basic land uses as summarized in Table 1, below: 1) Innovation Center and 4) Open Space. The Project assumes approximately 3,000,000 square feet of net usable building space for a variety of office and laboratory uses within typical building footprints ranging between 18,000 and 40,000 square feet. The variable footprints allow the Project to accommodate both small sites needed for start-up incubation spaces, and mid-to-larger sites needed for expanding businesses, and established companies. Employee support services, such as food services, day care, banking, fitness facilities, and other similar uses would also be permitted. Employee-supporting retail will be housed within the office buildings. The Project assumes approximately 800,000 square feet of building area for large open floor-plate (minimum of 30,000 square feet) spaces with a possibility of housing equipment required for such research, assembling, and development facilities. Some of the uses allowed may include high-tech business (such as agricultural, seed technology, bio-technology, food-science, and robotics related) with ancillary light manufacturing, wholesale, and assembly uses, and related uses. Parking areas within the Innovation Center will be designed in a manner to reduce urban heat island effects in comparison to barren surface parking lots. Parking areas will include a combination of integrated energy generation systems (such as photovoltaic carports), large canopy shaded trees, and permeable and high-albedo paving materials, to ensure that the parking areas have multiple functions, instead of just serving cars. Unique parking design concepts will be integrated to encourage use of rideshare modes (carpool, vanpool), compact and low-fuel using vehicles, and alternative-fuel vehicles. Parking areas will be located throughout the site to allow for shared facilities among various tenants. Both surface and structured parking will be allowed to meet the needs of the users. The Project assumes approximately 200,000 square feet of hotel uses to be located near the entrance of the site, from John Jones Road and along Highway 113. It is anticipated that the Project would include a 200-room hotel with convention and meeting spaces, food service facilities, and exhibition areas. This land use is intended to serve as a common facility for the businesses within the Project campus. The Hospitality site is primarily envisioned to include short-term-lodging for employees and visitors, and house modern conferencing facilities that can support symposia and other events related to the business needs of the various employers in the campus. The Innovation Center land use will also include various designed landscape areas for employee use such as, internal plazas, courtyards, public gathering areas, and low-impact stormwater management areas. Overall, the net F.A.R of the Innovation Center land use will be approximately 0.6, with a maximum building height of 140 feet. Open Space land uses, including natural open space and drainage areas along the edge of the property, will include community pedestrian and bicycle trails and facilities, landscaped open gathering spaces and corridors, and other landscaped spaces. The overall green spaces in the Project will also include open space and landscaped areas allowed within the Innovation Center designed primarily as internal plazas, courtyards, and landscaped areas for employee use. The overall green space within the Project site, including both open spaces along the property edge, as well as, landscaped areas associated with the buildings, will be approximately 85 acres or a total of 40% of the Project site. The total green space along the property edge will be 52 acres of open space, 25% of the site acreage. Open spaces will be designed as natural areas along the periphery of the site with community pedestrian and bike trails. Along the periphery of the Project, the open space would vary in width between 100 and150 feet, and would accommodate drainage, passive recreation areas (such as benches, picnic areas, viewing areas), and pedestrian and bike trails. An open space buffer adjacent to the agricultural land uses on the north and western boundary of the Project site, and Binning Farms community to the north, will be at least 150 feet wide. Open space adjacent to John Jones Road to the east and along Sutter Davis Hospital will be at least100 feet wide. The project construction would be completed in 4 different phases. Phase 1 (approximately 83 acres) will include development directly north of Covell Boulevard, along with portion of the open space and drainage system connection to the detention pond. Phase 1 will also include portion of the open space directly south of the Binning Farms community. Phase 2 (approximately 42 acres) will include portions of development on both sides of the detention area, and create the central common employee gathering area. Phase 3 (approximately 56 acres) will include development of the R&D/ Flex space land use parcels, and the open space areas directly adjoining these parcels. Phase 4 (approximately 27 acres) will include the remaining portion of the site.